Jon Witt of deck building firm Witt’s Woods & Greens based in Ontario, Canada, selected the CAMO® Edge Fastening System for two award-winning projects entered in the North American Deck & Railing Association's 2017 deck competition. Witt's Woods & Greens built this award-winning boat dock and boat house with the CAMO Deck Fastening system. Jon Witt, owner of Witt’s Woods & Greens, selected the CAMO® Edge Fastening System for the construction of an award-winning two-story boathouse and dock on Sturgeon Lake, in Ontario. The North American Deck and Railing Association (NADRA) named the dock the second place winner in the “Best Dock” category as part of its 2017 National Deck Competition. 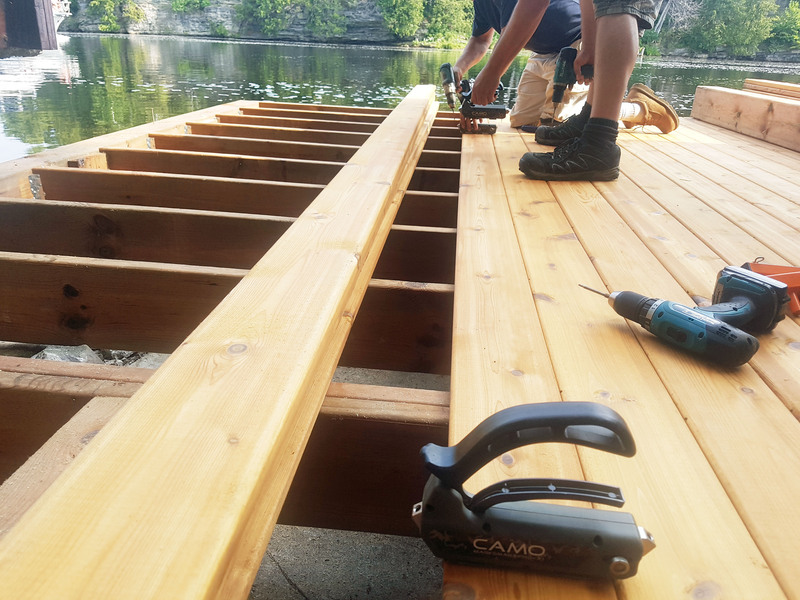 Witt’s crew used Western red cedar decking and fastened the edges with the CAMO Edge Fastening System using the Marksman Pro®-X1. The result is a secure, fastener-free surface solution that emphasizes the beauty of the dock and its rocky, cliffside surroundings. Witt also won 2nd place in the wood deck category for a 380-square foot Thermory-modified scots pine deck treated with CUTEK Extreme. 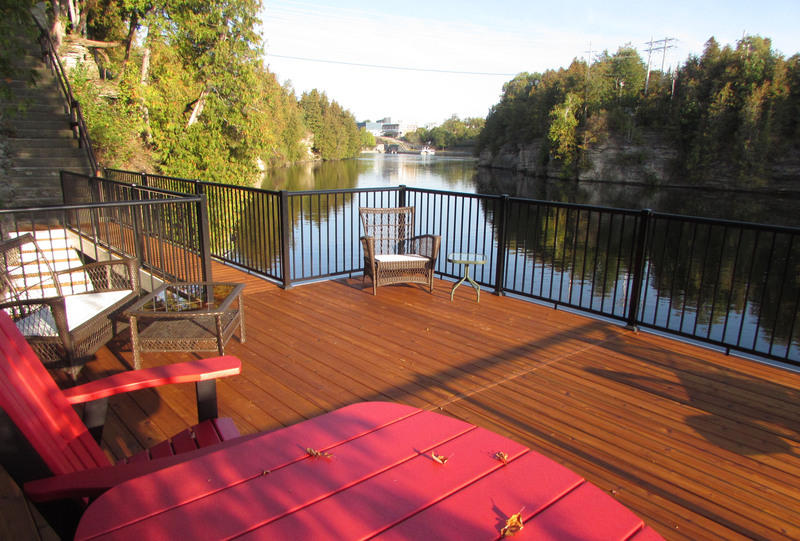 The multi-tiered deck in Lindsay, Ontario, features CAMO on all deck surfaces, trim and accessories. Located on Sturgeon Lake, the two-story boat house has 980 square ft. of deck area and sits at the bottom of a 45-foot rock cliff alongside the cliff wall. The upper deck is waterproofed to keep the boat house dry below. Witt’s Woods & Greens, located in Fenelon Falls, Ontario, has used CAMO as their primary fastening system for several years. They rely on the Marksman Pro-X1 with 1/16 of an inch spacing. With the CAMO Marksman Pro-X1, Witt’s crew can quickly and easily deliver CAMO® Edge Deck Screws into the edge of solid or grooved deck boards for fast installation. It employs a simple technology that is easy to use. The contractors simply load the proprietary deck screws into the hand-held guides that position them to be driven into the edge of the deck boards and provide automatic gapping. Special driver bits are included with the screws to ensure depth of drive. CAMO offers several guides including the Marksman Pro, Marksman Pro®-X1, MarksmanPro-NB and the no-gap guide, Marksman Edge™ which ranges in cost from $20 to $50. 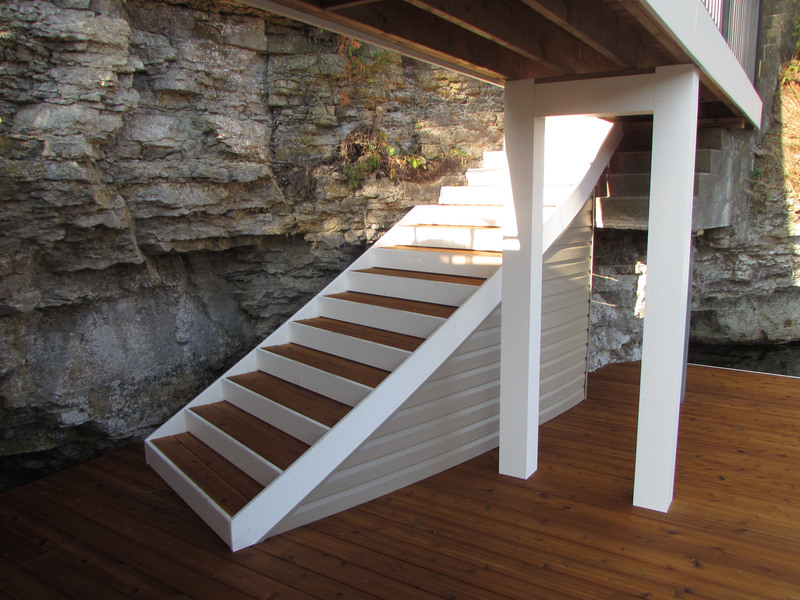 They work with virtually any decking material—composite, PVC, and most soft and hard wood species with variations to accommodate nominal 6-inch boards as well as narrow boards, and offer a variety of spacing choices, including a no-gap option for treated wood decks that can also be used with secondary spacers when wider gaps are desired. “We use CAMO for house trim fasteners as well and always have it on hand as a standard stock item,” says Witt. "We like the CAMO system for decks because it’s quick and easy to learn, the presets only let it go as deep as it has to go, and it’s very user friendly. I can’t see us using anything else in the future--it’s too beneficial to our business." Witt and crew found the CAMO system easy to learn and use to achieve a beautiful, barefoot-friendly deck surface. Jon Witt's award-winning deck used the CAMO Edge Fastening System to achieve a fastener-free surface. Witt's Woods & Greens engineered a boat dock into the natural setting of a rocky cliff.